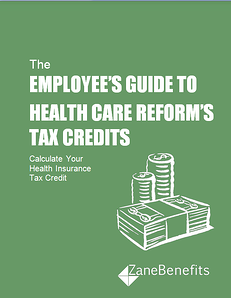 Zane Benefits, which provides businesses with web-based health reimbursement arrangements, today announced it had published a free eBook named “The Employee's Guide to Health Care Reform's Tax Credits” to help employees calculate their health insurance tax credit for 2014. Beginning in 2014, massive tax credits will become available to help individuals buy health insurance coverage through the new state Health Insurance Marketplaces. If an employee is eligible, these tax credits will cap the cost of his or her family’s health insurance at 2 - 9.5% of income. What’s the catch? The catch is that these tax credits are only available via a state individual Health Insurance Marketplace. As a result, starting in 2014, many employees will be able to secure less expensive health insurance coverage on the individual market. Employees should utilize this guide to determine whether they are eligible for a tax credit in 2014.